Bruce-Monroe | Park View, D.C. In a meeting at the Wilson Building late on Friday afternoon (5/20/11), Deputy Mayor for Education De’Shawn Wright announced that the District would be moving forward with the modernization of the Park View School and had no plans to build a new school on the Bruce-Monroe site, which will continue being used as a community park for the immediate future. Deputy Mayor Wright began the meeting by briefly recapping the events that lead to the present public school situation in Park View. He acknowledged the frustration of the communities impacted by these events and clearly stated that the purpose of the meeting was to map the path forward. 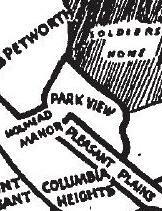 As learned in the meeting, one factor in the decision to move forward with the Park View modernization was the District’s inability to secure the public/private partnership for the redevelopment of the Bruce-Monroe site that would have financed a new school building. Other factors included the investment of $3.3M in the Park View School that has already occurred since 2008 and the solid condition of the school’s overall structure. 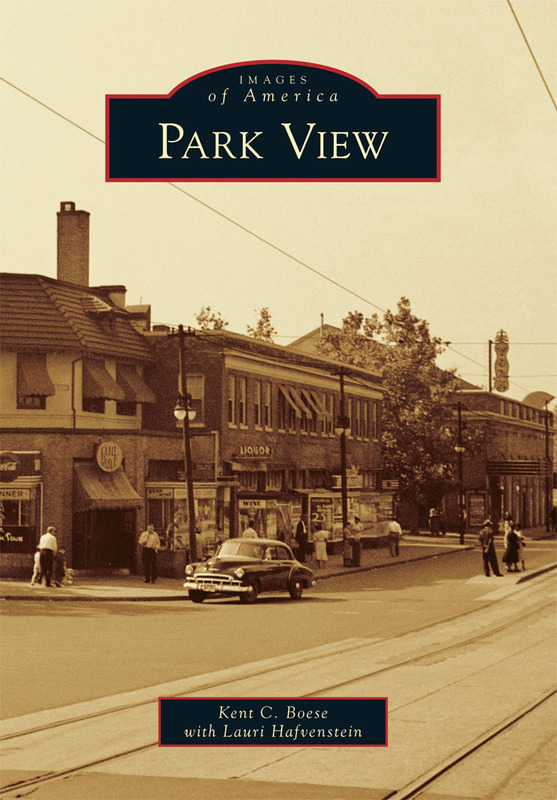 It was also noted that the basic design of Park View is good and that the District would not be able to achieve the same results with a new building for the same money. Even with the improvements already made at Park View, Deputy Mayor Wright made it clear that the school does not currently live up to the standards that parents, teachers, and the community should expect. Nor does Park View currently provide an ideal learning environment. Deputy Mayor Wright then asked Mel Butler of the Office of Public Education Facilities Modernization (OPEFM) to explain the next steps in modernizing the school. Butler began by giving details on the $3.3M already invested at Park View. And here’s more information on the Bruce Monroe development bid … again from the Washington Business Journal. “EYA and NDC submitted the only bid to redevelop the 121,825-square-foot parcel in the 3000 block of Georgia Avenue, former home to the razed Bruce Monroe Elementary School and current home to an interim park that many in the community don’t want to give up. Bidders were required to submit two proposals, one with a new school and one without. .
Envisioning how buildings used to look can be fun. 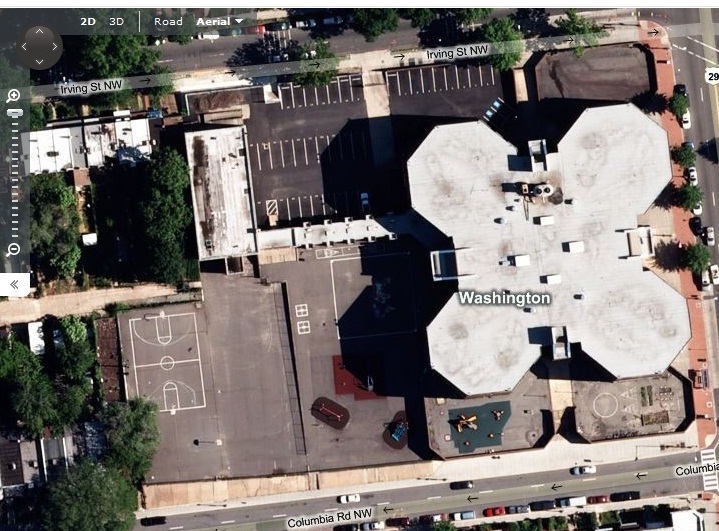 Now thanks to Google, we can see satellite views of recent redevelopment. See below for before (2009) & after (9/2010) overhead shots of the Bruce Monroe site. Reminder: Solicitation of Proposals for the Redevelopment of the Former Bruce Monroe School Site – DUE 10/14 @ 3pm EDT. 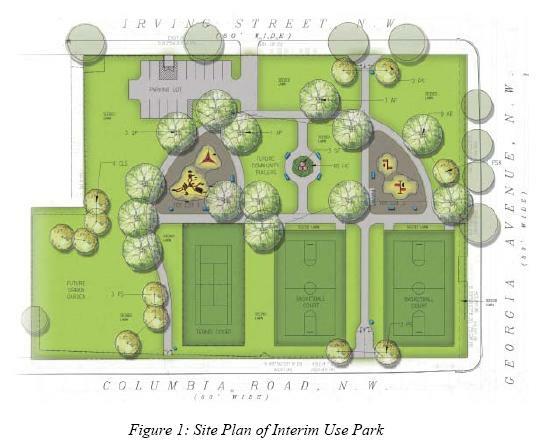 What Should Be the Future of Bruce Monroe Park? 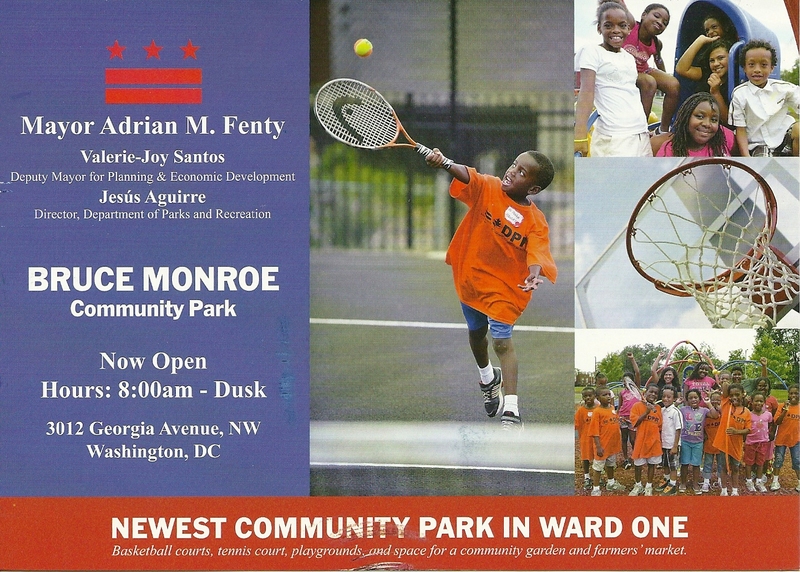 So far, I’ve received the following postcard a total of two times in the mail announcing the “newest community park in Ward One.” The reverse of the card contains the same phrase in Spanish along with the information that the park is the outcome of a $2 million investment. Considering the investment in development, and now the investment in informing the community about this new Georgia Avenue asset, I can’t help but wonder how this fits in with the RFP issued for the redevelopment of this 3 acre site. Readers may recall that the RFP contains two options, one to develop the site with a new school and a mixed-use development, and one to develop the site commercially and renovate the Park View school. Now, upon receiving these post cards and hearing many positive comments, I wonder if there isn’t a third option … that of just keeping the park. While maintaining the park or redeveloping the site without a new school has its critics, removal of a publicly used park is also likely to meet with community resistance. So what do you think? Should the property be redeveloped or left as a park? According to a source at DMPED, the initial phase of the interim Bruce-Monroe project has been completed and the park was open to the public yesterday. I stopped by to take a look, but the property wasn’t open at the time I was there. I’d be interested in knowing if anyone has been on site and what visitors’ initial thoughts are. The second phase of the project is still underway. This phase include the building for the educational programming on the site. 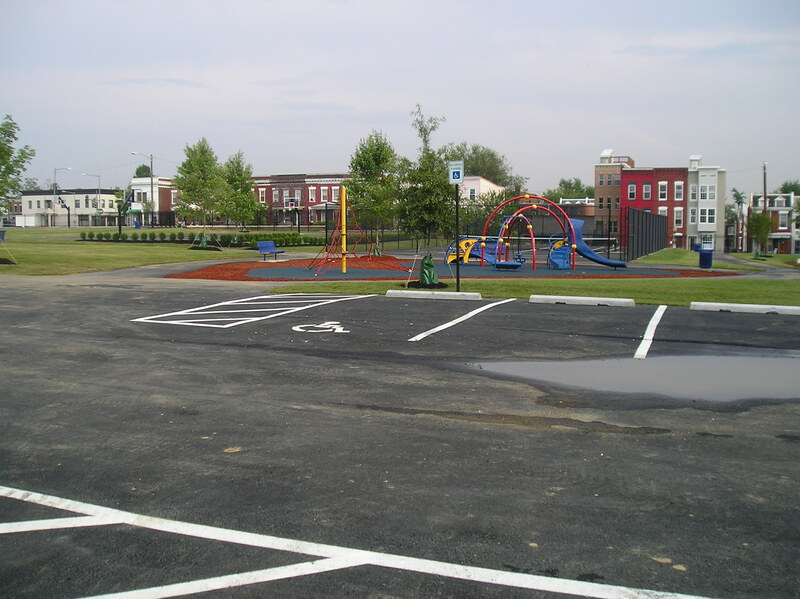 As you can see from the images below, the park includes playground equipment, benches, athletic courts, and basic landscaping. 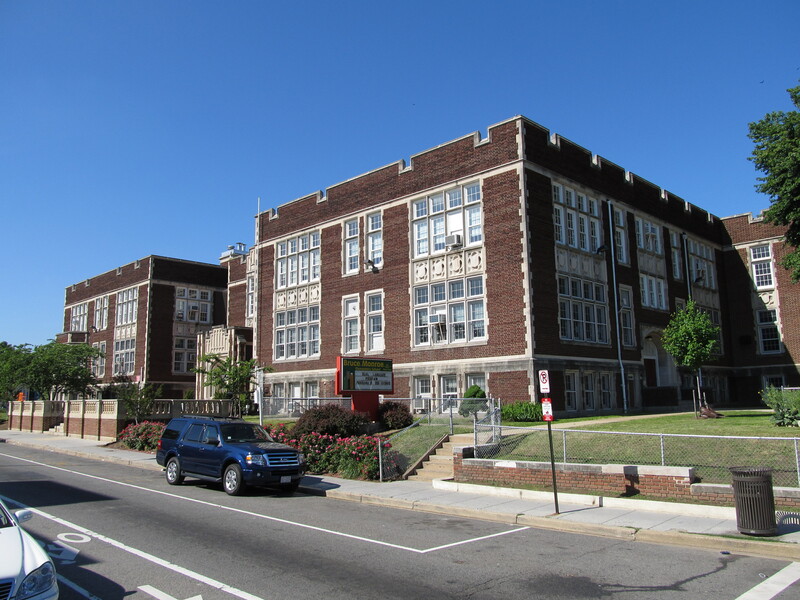 As noted by the Washington City Paper, the District released their request for proposals to redevelop the former Bruce-Monroe school site on July 26th. Those interested in reading the full RFP, as well as the contents of the four appendices, can do so by going to the Deputy Mayor for Planning and Economic Development’s Web site. As briefly described in the introduction of the proposal, the Development Site is approximately 121,825 square feet in size and is currently split-zoned (C-2-A/R-4). 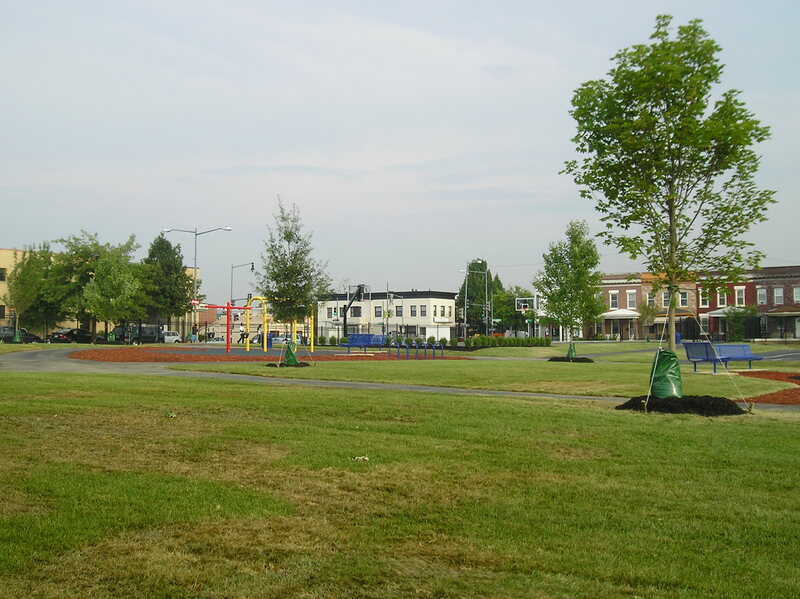 The Site currently contains an interim community park with various hardscape playing fields and asphalt pathways. Until 2008, the site had been used as a 3-story, 110,000 square foot elementary school. Proposals are due on October 14, 2010. A forum for all interested parties in the site will be held at a pre-proposal conference and site visit at the GADGET Center, 2801 Georgia Avenue, NW, on August 10, 2010, at 10:00 a.m. In perusing the RFP, some notable details stood out. The first was the option for interested parties to propose either a school and commercial project OR just a commercial project. In both options, a better area school is a stated goal of the development. Where that school is, however, depends upon the focus. In the event of a proposal for a school and commercial development, a new school would return to the Bruce-Monroe site. If interested parties focus on the commercial aspect, the RFP clearly states that “this development option will include a ground lease or a fee-simple conveyance of the entire site. In this option, the proceeds from the conveyance may be utilized [sic] to fund school improvement at the off-site Bruce Monroe Elementary School at Parkview [sic] — P. 4” (emphasis mine). While the stated goal of the solicitation is to develop a new school facility and a state-of-the-art mixed-use development on Georgia Avenue, the inclusion of an option that would generate funds to modernize the Park View school is a significant detail. While there is every possibility that this clause may turn out to be meaningless depending upon the proposals received, it does indicate that the City and DCPS is taking a much larger view of the needs of the immediate community and the Georgia Avenue corridor as a whole. Factoring in the newly completed $2M interim park on the former Bruce-Monroe site, it strikes me that redevelopment of the property may become more difficult rather than simpler. From solely a financial perspective, the best interim option was the original $500,000 parking lot proposal. No one wanted a parking lot and everyone would have been happy to see it removed in five years. 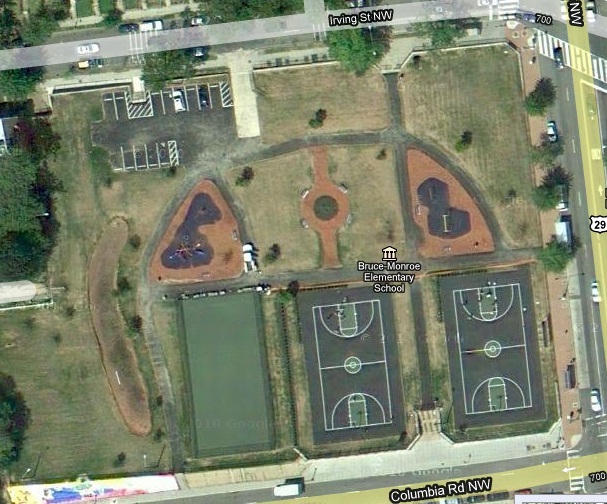 With the advent of two basketball courts, a tennis court, and two tot lots – not to mention green space in an area that has been documented time and again to be lacking in park land when compared to other sections of the city – some residents aren’t likely to be as willing to watch a new community asset be redeveloped for a building. This doesn’t mean that it can’t happen. But it does set a much higher bar for a developer to propose a smart development that meets the commercial, educational, and communal needs of the area. Is it possible to have an attractive, pedestrian-friendly proposal that includes a school, mixed-income housing, commercial space, and publicly accessible green space? Probably, but it is going to take an exceptionally talented and creative team to fit all this onto this 121,825 square foot property.